As of today, the armored forces have 280 Type 74 MBTs, 341 Type 90, and 53 Type 10 in service (674 total). Most tracked vehicles are produced by Mitsubishi Heavy Industries and their suppliers. Outside a wheeled tank destroyer similar to the Italian Centauro, the only IFV today in service with the JSDGF is the Type 89 also produced by Mitsubishi (89). The tracked APCs Type 73 provided the bulk of the type with 338 machines. Previous MBTs like the Type 61 MBTs are now discarded. Komatsu and its subcontractors usually provide the wheeled vehicles, APCs like the Type 82 Command, Type 87 armored recce, Type 96 APCs, specialized Chemical and NBC recce vehicle, a light 4×4 armored scout. Nissan Motors Aerospace was responsible for a series of MCV (mine-clearance vehicles) based on the Type 90. In total, this represents around 2870 vehicles. The bulk of ported artillery capabilities are provided by Mitsubishi’s Type 99 SPG and the license-built (by Hitachi) M110 Self-propelled Howitzer, while rocket firing tracked M270 MLRS (also license-built, by IHI Aerospace). There are also two types of ammo supply vehicles, the Type 87 and 99, both tracked. Another derived vehicle, the tracked Type 96 120mm Self-Propelled Mortar is also in service, as the only SPAAG, the Type 87 Self-Propelled Anti-Aircraft Gun. In total, around 400 artillery vehicles. The grand total as of today is around armored 3940 vehicles. Anti-tank missiles include the Type 01 Light Anti-Tank Missile (1,073 produced), the Type 79 Anti-Landing craft and Anti-Tank Missile, and the Type 87 Anti-Tank Missile. The latter are carried by the Type 89 IFV. Anti-tank helicopters are the Fuji license-built Boeing AH-64 Apache (13) and Bell AH-1 Cobra (88), and the domestic scout Kawasaki OH-1 (38, 101 on order). The JSDGF’s own airforce operates 497 aircrafts in all as of 2014, the bulk being US-licenced transport helicopters. Inspired by the Swiss MOWAG Piranha and other fast wheeled APCs, Komatsu’s Type 96 are still produced today. 365 are currently in service with the JSDGF. 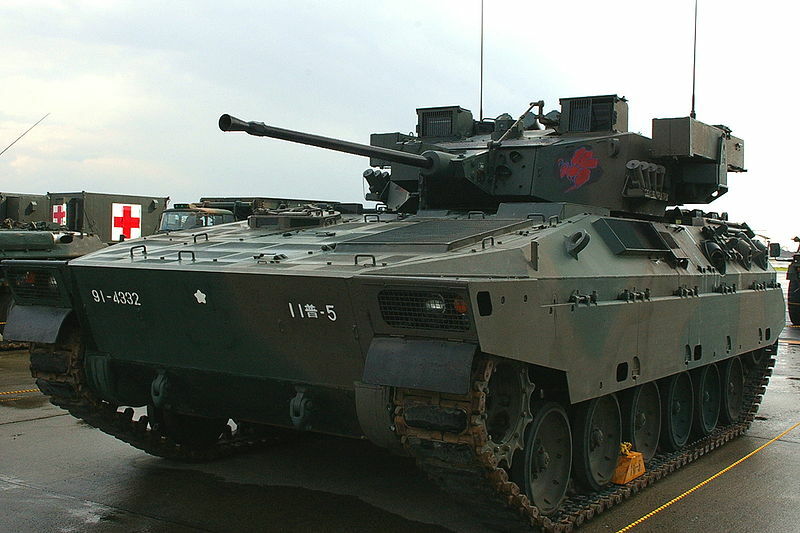 The only true Japanese IFV is the Type 89, conceived during the cold war (1980) as a Japanese “Bradley”. Production is scheduled until 2018. Komatu’s LAV (2002). A versatile vehicle comparable to a lighter version of the Hummer. Actual production figures are 1855 vehicles. Type 96 self-propelled mortar carrier or Gottohanma (24 built by Built by Hitachi and Howa). The Type 90 Kyū-maru entered service in 1990, replacing the aging Type 61 and Type 74. It retained the feature of having hydropneumatic suspension and was armed with a license-built copy of the famous Rheinmetall L44 120mm Smooth-Bore Gun, as used on the German Leopard 2 and American M1 Abrams. The Type 10 Hitomaru entered service in 2012, complimenting the still serving Type 90. It is one of the most technologically advanced main battle tanks with a connective net that allows all branches of the military to communicate together in battle. It is armed with a home-built 120mm Gun and retained the Hydropneumatic suspension of previous vehicles. It also features a modular armor system. 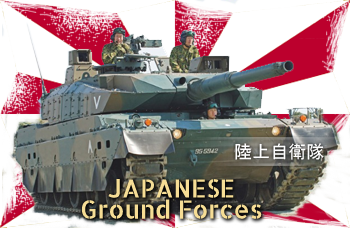 The Type 89 is the JGSDF’s only true Infantry Fighting Vehicle (IFV). It entered service in 1989 and is armed with a Oerlikon Contraves 35 millimeter KDE cannon. The Type 99 self-propelled howitzer entered service in 1999 as a successor to the aging Type 75. The SPH is armed with a 155mm L52 howitzer from Japan Steel Works (JSW). rendition of the Type 16 CMV by Tank Encyclopedia’s creator. This is the next generation “wheeled tank”, derived from the centauro. It’s a no-compromise solution where protection is sacrified for mobility and firepower, a first-so-see, first-to-kill proposition reminiscent of the Battlecruiser concept.